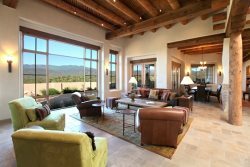 Just eight blocks from Santa Fe’s galleries and restaurants, this 2,000-square-foot, two bedroom adobe home blends French country and central Mexican accents with Southwestern decor to create a beautiful space full of art and antiques. The master bedroom has a king size bed, adjacent bath with jacuzzi tub and a kiva fireplace. The second bedroom features a queen size bed near a full bathroom. Each bedroom includes two bathrobes and an array of bath products. The kitchen is fully equipped and the dining room seats eight. The living room’s focal point is a classic Santa Fe kiva fireplace. Outside, there is a large patio with flagstone terrace and beautiful landscaping creating a private and quiet place to relax. The vacation rental’s other amenities include color cable TV/VCR, stereo/CD system, washer/dryer, one car garage, off street parking, refrigerated air-conditioning and high speed internet. Approximately 2,000 net square feet.